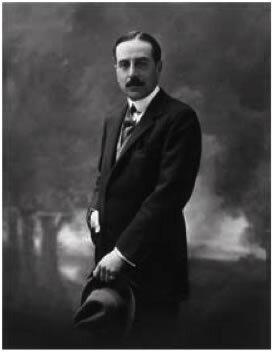 Alberto Santos-Dumont, father of controlled hot-air balloon flight with Aaron de Anchorena. Above, all is silent…. Despite the season, it is cold and the crew speechlessly observes a landscape that no human eye has seen before. From the balloon’s basket, both sides of the world’s widest river are clearly visible; its surface appearing slightly curly while shining in the noonday sun. Sand banks imply the river’s silhouette at the water’s surface as a barge carrying flat stone looks like a miniature embedded in the scenery below. The Pampero continues its relentless climb above the brownish waters of the Rio de la Plata, and in less than an hour's flight reaches its maximum altitude of 9,300 feet. Soon after, as it nears the Uruguayan coast, it begins losing altitude. The force of gravity gradually overcomes the lightness of the hot air, and the hot-air-balloon continues its fall. In panic the two aeronauts throw their personal effects, sandbags, sea anchor, ropes, barometer, altimeter and other instruments into the approaching waters. But their actions are all in vain - "El Pampero" rushes as if guided by the relentless hand of fate. In a final effort to undo their destiny, the men release the basket, and cling to the net that wraps the balloon. At this point they are nearly skimming atop the river's surface, so close they can breathe its sweet aroma. "El Pampero" finally drops and rebounds with the two men clinging to the edges of the net as this mad race finally ends a few miles inland. The two aeronauts, now dazed and swaying, look around wondering where they are, and realizing the reality of their situation, they embrace as one. 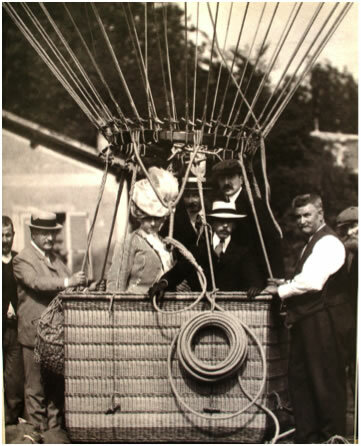 The balloon ride was a success despite the improvised landing; they crossed the almighty Rio de la Plata for the first time ever as no human had ever challenged before. Aaron Anchorena looks at the surrounding countryside remembering the agreement he made with his mother. Maria Mercedes Castellanos de Anchorena, a strong woman from the wealthiest family in Argentina, has continued to lead the family business after the death of her husband. She would buy his son the ranch he wanted if he agrees to quit flying. He sets only one condition: he would choose the fields he will settle from the air, more precisely from the basket of "El Pampero". That trip sealed forever the fate of both crew members. Aaron Anchorena dedicated his life to transforming and beautifying the land that had granted him luck while his pilot and partner, Jorge Newbery, pursued his passion for air navigation, and would later die in a plane crash. From that day on, the Anchorena Ranch was born to become a praised National Park as well as the Uruguayan Presidential retreat. This was in December 1905.